A shot I made two years ago when I was camping near this location here. I remember this mountain very well, because I had to go up to the peak 4 times in a row during one week, until finally I could make a very specific shot I wanted to do (not this one here). But the vistas to the entire area were exquisite at the top because this peak is more than 3’000 Meters high while the other mountains surrounding this one here were a bit lower. I simply love exactly this part here at the border between vegetation and the part where it only has rocks on the ground due to the light illumination of all small hills. Well, for sure not a sunrise or sunset. And for sure not a stunning light drama with fog and clouds in it. Simply a rock face I found on my way down a gorge to a river I wanted to visit. This rock face attracted my interest as it looked really pleasing to me with all the fine structures and details. 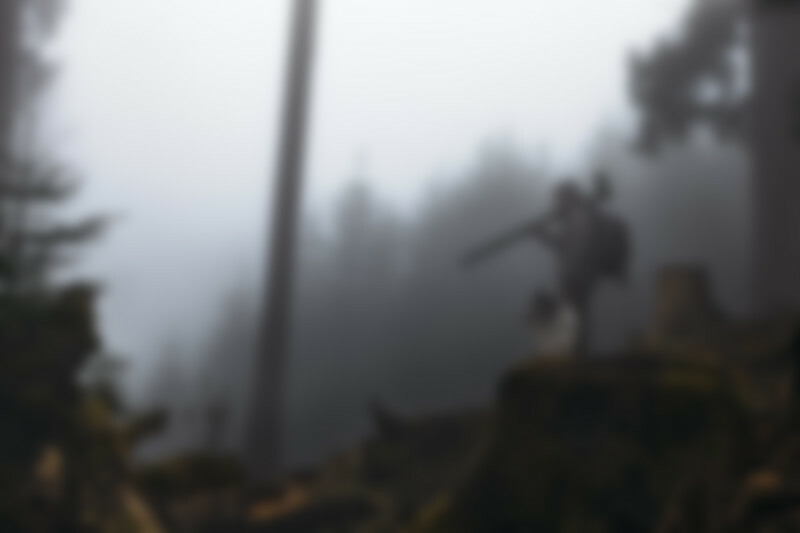 I just found an old image I made one year ago in the valley you saw in my last post. Nothing special but I thought I will show you this one here as well instead of letting this image unseen on my hard drive! „Fire dance over the mountains“ I already posted one horizontal shot of this location and also a „Behind-the-scenes“-shot on FB and Insta. This time I show you the vertical one I made some time later the evening when I was here waiting for the sunset. As you can see the atmosphere had really an epic character. But to change a bit the view I positioned my tripod only 100 meters away from the hiking path in front of some stones and rocks I found at this area. And then it was really easy to wait for the beginning of the sky burning! Well, for sure another shot I made during my stay in the mountains this summer! I was fascinated about how the sunrise could illuminate only some parts of the mountains on the right in the distance. For me a place and moment to remember and I hope you enjoy this vision as well. Well, an image I found in my archives. A very colorful shot and not the kind of shot I’m usually doing with such rich colors, but it reminds me a bit of the area where Hobbits are living in that famous story. Perhaps because of all this small hills here and of course the clouds which are provoking all this lights and shadows areas around the entire location. Nevertheless I hope you like it and I wish everybody a fine weekend. 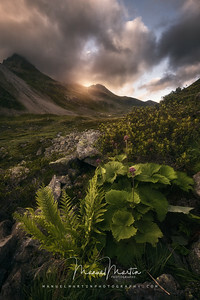 A shot from my last trip to the Swiss Alps, where I was looking for wonderful spots and hoping that the sunrise would give me epic moments. And while I was waiting for the sunrise and everything was quite and tranquil, nature gave me the sensation of being completely alone in this wonderful world. Just at this moment I had the strong feeling that everything was in balance and I could enjoy the wonders of this world! Such moment are like to encounter a huge sleeping dragon, who reveals his beauty only in a single moment. I hope you enjoy this moment here as well. Well, I have to apologize for this image here. A very simple picture … without a real foreground or interesting composition. 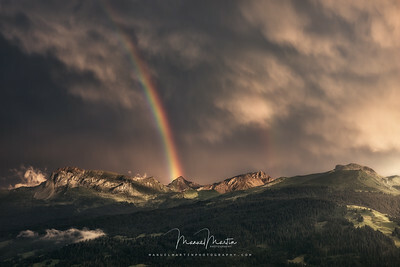 In fact I was making a small walk with our dog on the other side of the valley after a huge thunderstorm, when suddenly this amazing light and rainbow came out of nowhere. And I had no chance to find something really interesting on my way … just the time to take my cam and make this image handheld. But honestly … not to make a shot would have been a crime ;-) I rarely experience something like this on a planned hike. And usually I’m at the wrong place and wrong time when there are such an atmospheric mood. But for heaven’s sake … where is the pink unicorn and the small naked angels playing the harp and flying around the area??? 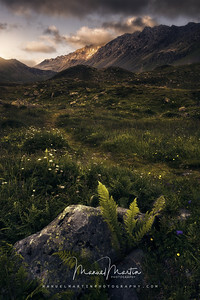 I made this shot here last year when I was hiking in the southeast of the Swiss Alps. Just at the beginning of the sunrise after some time hiking I decided to make a photo of this area and despite it is an old image I want to show it here. I wish everyone a wonderful weekend and I hope you enjoy this view into the distance. I made this shot here last year in Summer when I was reaching this wonderful peak of a mountain at an altitude of more than 3’000 meters. And more or less 15 minutes away from the peak I made a break to make this shot here. Well … not the best light … in fact it was a mix of soft and hard light and a challenge to get something useful with the cam but it’s always something special when you get at such locations. And even more the weather conditions changed to something not so comfortable as you can see on the image! In fact when I was seeing the summit it just began to rain … you can see some of the first water drops on the rocks on the right part of the image. But it was really amazing to be there and to feel the cold and fresh air despite it was Summer. For the sense of scale … the first rock on the left side was bigger than me he he he and I had to climb a bit to get at the more comfortable hiking part on my way up. I’m still wondering and impressed about how my dog „Giorgio“ (a collie) always could find his way to follow me he he he :-) I hope you like it. During my stay in the Swiss Alps I had once again the opportunity to visit one of my favourite places. I love it to be here and to experience the tranquility this place transmit. And it seems as if the time stood still at this place. When I finally arrived I could see how a dense fog devoured the entire region. I couldn’t even see more than two meters. So I sat down on a rock and waited that something happened! And in fact after more than one hour … just in time at sunset … the fog liftet and gave me this wonderful view here! I hope you like my vision here. Hello everybody ;-) I’m back from my vacations and I hope everyone had a good time in the meantime. Well, I could make some shots during my hikes but I still wanted to show you this one here I made during the summer time. 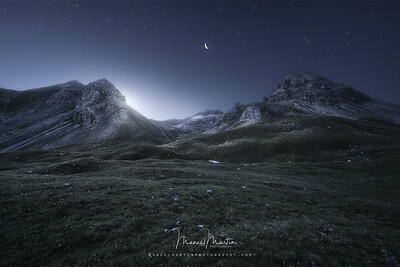 I could reach this high plateau in the Swiss Alps before sunrise but I had no idea how this area would look like with light! But as sunrise time approached, the light over the area became stronger and stronger and I could get an idea how the effect would be with a sun appearing from behind the rock formation on this place. So I had still enough time to look for a good place where I could position my tripod and wait for the sun to appear! 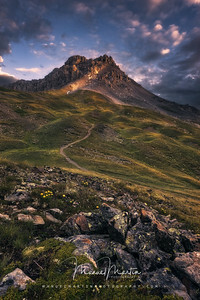 I was at this summit several times during the week in succession to photograph the area at sunrise. But the light was never as I wanted it. Most of the time a thick cloud covered the entire sky over the entire area … until this morning here. Finally I said to myself, finally the mood was exactly as in my imagination. And as the sun greeted the world this morning, the first rays could reach the mountain top and bring some rock formations to shine. That was really impressive and my dog Giorgio and I were able to attend this wonderful spectacle while the rest of the world down in the valley was still in bed at this time in the morning! Well, for sure not one of my best. But my intention here was to show you the wonderful valley where I was guest during one week in the Swiss Alps. Not very far from here, we had set up our tent in the woods and this evening here I tried to find a spot from where I could show the entire valley in an image. 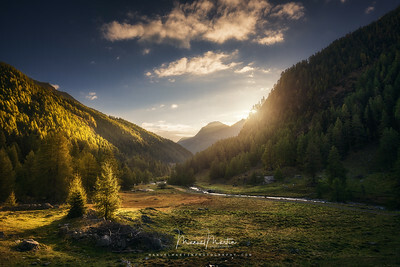 This valley lies in the south-eastern corner of the canton Graubünden and stretches over 18 kilometers between the Ofen Pass and the Italian Vinschgau. And also the trip to reach this valley across the Ofen Pass is already an adventure. From Zernez in Lower Engadine the road rises through the Swiss National Park to the Pass Ridge. The cultural highlight of the valley is the Benedictine monastery of St. Johann, a UNESCO World Cultural Heritage Site in the border town of Müstair. The monastery church from the year 775 boasts the world’s largest fresco cycle of the early Middle Ages and is a jewel of the visual arts of the Carolingian Era. 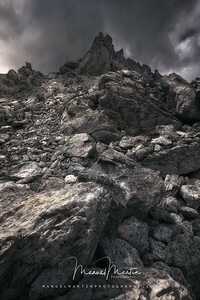 This was the first shot I made during my vacations in the Swiss Alps. For sure it was only a small hike up towards the mountain peaks but I was wondering what I would see on that day with such wonderful and quick changing light conditions! When I reached this area here it looked like as if the gods were sending this light to the earth to brighten the gloom of the shadows of death in the world. For me simply beautiful and I had hurry to catch this vision here. 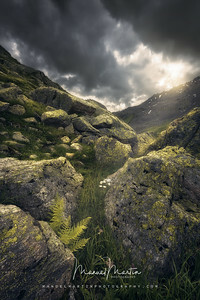 Well, I made this image here in May when I was in the Swiss Alps for one week. Sure, not the best time in the afternoon to make some shots. And moreover it rained, snowed and hailed all the time during the whole day. But there was this cloudburst only for a brief moment and I could have this view over the entire area. And despite the bad light I tried to make a shot as you can see.